It’s well into the frenzy of New York Comic Con and the announcements from Bioware on Star Wars: The Old Republic are filtering out. 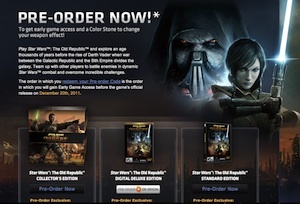 One of the smaller ones is the ‘global launch’ date for SWTOR of the 20th December this year. For those new to the issue, the half of Europe having a formal launch (i.e. able to buy copies of the game in their country) were getting access to the game 2 days later than their USA counterparts. 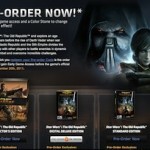 Now, they’ll have access the same day – a positive sign one would think on Bioware’s readiness for the influx. Sure, they’re different servers anyway but the support services are still more likely to be pressured if ‘everyone’ starts access at the same time. So, a good sign. All that said, if you live outside North America or the parts of Europe slated for the launch, you need to pre-order the game from an overseas retailer in order to be playing around the 20th December 2011. To be fair, that probably does make it a global launch, just not one we’re used to where you can lay your hands on a box on the day. I was excited and depressed all in a matter of seconds!! How can they say it’s a global launch if it excludes more than 50% of the globe. Let’s hope that Biowares “There’s just one more thing” includes access for Aust and NZ. I note that Stephen Reid has been busy on twitter, defending the term ‘global release’ stating that “It’s a fairly typical use of the term in games.” I concur that it is indeed a commonly used term in gaming releases, however when game developers use that terminology, generally it includes countries like Australia/NZ/Singapore/etc. I was wondering those who purchased the CE pre-order how did you do it? I mean i’ve tried calling all the places that do the CE and they absolutely will not ship to Australia.